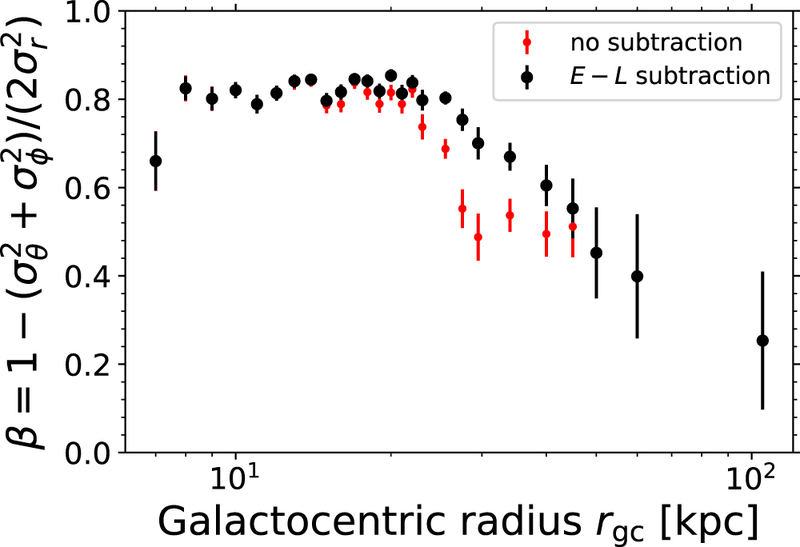 Anisotropy parameter β as a function of Galactocentric radius rgc for the entire sample of 7664 halo K giants (red dots) and for the sample with Sagittarius flagged and removed (remaining sample of 7182 K giants, black dots), to highlight the effect of this substructure in the sample. The error bars on β are propagated through from the errors in measuring σr, σθ, and σϕ (see Figure 4, upper panel). We see a dip from 25 to 40 kpc of the red-dot β profile, due to the effects of the Sagittarius stream (we select the stream stars in Figure 6). 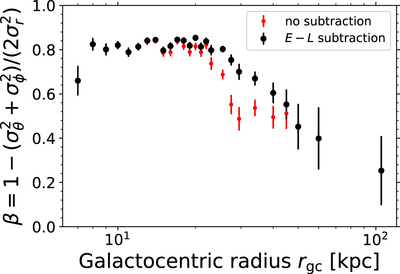 Removing these stars takes a strongly tangential orbital family out from the sample, making β more radial by ∼0.2.